Here’s one more thing I won’t be needing to stuff in my bag on a night out — a mirror. Thanks to my brand new Galaxy S III with a front-facing camera I’m good to go when I need to apply new lipstick–or more commonly, check to see if I’m sporting a bit of spinach in my teeth. Sure, the camera was supposed to be used for video calling, but so far it’s been more of a grooming aide than a communications tool. Front-facing cameras on phones are becoming more common in handsets for video conferencing, not that many people appear to be using them for that. The iPhone 4 (s aapl) first sported the front camera in the Apple ecosystem back in June of 2010, while the HTC Evo also in 2010 provided video-calling for Android (s goog) users. Popular new handsets from companies developing devices for the Android ecosystem are driving up the number of front-facing cameras in the market. The idea was that such cameras would be used for making mobile video calls, but I’m not sure how popular that is. Skype doesn’t provide data on the number of mobile video calls, and Apple doesn’t break out Facetime stats over mobile devices. In fact, it’s tough to find a company willing to share stats on how much people use video calls on their mobile device. 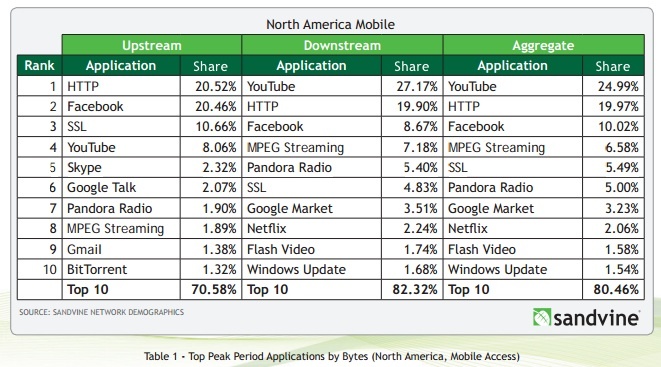 However, I pulled a chart from Sandvine’s global mobile internet report from the first half of 2012 that shows that video calls are a tiny percentage of the overall traffic generated by apps on mobile networks — somewhat surprising given that those apps use more bandwidth than something like checking Facebook. Perhaps the difficulty in using the carrier’s data network as opposed to Wi-Fi contributes to the lack of users. In my case, it’s a lack of friends who are willing or available to participate in a spontaneous mobile video call, but for whatever reason, video calling hasn’t seemed to catch up with the cameras on their phones just yet. But even if I don’t make a video call that camera is useful — albeit expensive. My trusty compact can now join my address book, my clip-on flashlight, my paperback and my little note pad in the list of items I no longer need to drag along with me when I’m out on the town. Of course, when the batteries are low, then I may have to choose between adjusting my make up and texting, but perhaps I’ll just use that room I created to bring along an extra battery. Great example of re-purposing technology to one’s needs. Is is the report only for mobile network or also one using wifi at home? As most video calls will be done on wifi not 3G or 2G.